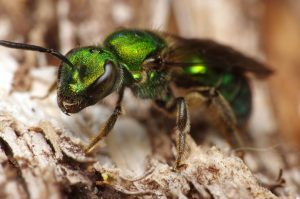 Pollinators that nest in dead wood are considered saproxylic. Photo by Pascall Gaudette (Doundounba), CC 2.0. Bark-feeders, fungus-feeders, wood-borers, and wood-nesting bees – all are saproxylic insects, which means they depend on dead or dying wood. The insects that prey on or parasitize them are also considered saproxylic. 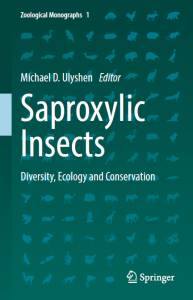 Over almost 900 pages, the book synthesizes the scientific literature on saproxylic insects. It represents the efforts of 41 experts from Australia, Austria, Canada, Estonia, Finland, France, Germany, Italy, New Zealand, South Africa, Spain, Sweden, Switzerland, the Netherlands, the United Kingdom, and the U.S.
Saproxylic insects have declined in many regions. Forest loss is one factor. And intensively managed forests may not have enough dead wood to support saproxylic insects. “Declines have been best documented in well-studied regions such as Europe,” says Ulyshen. Scientists suspect saproxylic insects are declining in some parts of the U.S. as well. A comprehensive synthesis of the science on saproxylic insects. Like other insects, saproxylic insects contribute to the world’s biodiversity. Insects are interesting and beautiful – many have brilliant colors and bizarre life histories. They also have important places in food webs and nutrient cycles. “Population declines are concerning given the many ecosystem services saproxylic insects provide,” says Ulyshen. For example, saproxylic insects speed up wood decomposition. Termites can consume as much as 20 percent of dead wood’s volume in the southeastern U.S. and probably more in the tropics. Termites are notorious for bringing their wood-chomping ways to people’s homes, furniture, and other wooden things. Every year, termite damage costs an estimated $40 billion globally. But what’s unwanted at home can be helpful in a forest: termites decompose wood, aerate soil, and are part of nutrient cycles. “Over time, appreciation for the ecosystem services they provide has grown,” says Ulyshen. Termites colonize wood as soon as it begins to die. 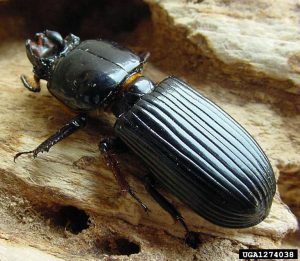 Bark beetles and wood-boring beetles are also quick to colonize, and they carry fungus along with them. Eventually, Passalid beetles arrive. Passalid beetles are often called bess or betsy beetles, and they have a unique subsocial lifestyle – small family groups live together in the same decaying log, cooperating to care for young larvae. Passalid beetles are most abundant and diverse in subtropical and tropical forests, as are termites. Termites live in highly organized eusocial colonies. A colony may have thousands of termites, but each individual termite has only one role – either a worker, soldier, or reproductive. “Uniting the bodies of literature on social and nonsocial saproxylic insects was one of our goals for this book,” says Ulyshen, who wrote a chapter on the Passalidae family. In addition to the intrinsic value of their existence plus their ability to decompose dead wood, some saproxylic insects – particularly flies – help control pests. Some of the most important natural enemies of bark beetles are saproxylic flies, as Ulyshen discusses in a chapter on saproxylic Diptera. Ulyshen and his colleagues also wrote a chapter about saproxylic insects and non-native wood. One case study Ulyshen and his colleagues conducted in Georgia and Mississippi suggests termites do not readily attack Chinese privet, mimosa, or chinaberry. One way to keep dead wood is to simply retain dead and dying trees, particularly after a natural disturbance in a protected area. Variable retention harvesting is another option. In this silvicultural system, living and dead trees are retained at the time of harvest as an alternative to clearcutting. In general, the system works best for saproxylic insects if some trees are clustered in one area and others are dispersed. Prescribed fire can improve the conservation value of such approaches. Giant stag beetles depend on dead wood. Photo by Sam Droege, USGS Bee Inventory & Monitoring Lab. “There has been dramatic change in how foresters view dead wood in forests over the past half century or so,” says Ulyshen. Other objectives of the book were to incorporate information from regions outside of Europe, highlight less studied taxa and address the value of highly decomposed wood, or veteris. The book is a major step towards uniting bodies of literature that have been sharply divided along geographic and taxonomic lines.